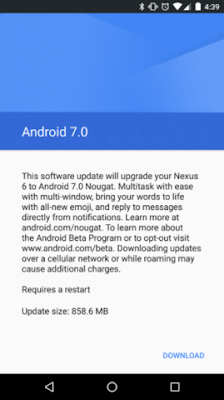 Upgrade to Android 7.0 Nougat is now available for all versions of Nexus 6, it doesn't matter whether you are on Android 6.0.1 Marshmallow or the beta version of the Android Developer N. If you are using custom firmware and you are unable to receive the OTA update , you can download stock official firmware here or the OTA update file here. This manual installation is only for advanced users only and those who have previous experience. 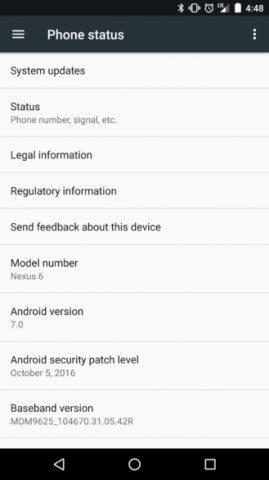 Google has traditionally started the new month with the release of regular security updates for the Nexus line of devices. The update includes closing vulnerabilities in the MediaTek, Qualcomm, NVIDIA, Synaptics, Motorola, drivers as well as in the Android system. In this montha total of 5 critical vulnerabilities, 29 high-severity bugs, and 13 moderate low level critical issues was patched and closed. The list of all patches is available on the google Android security security website. 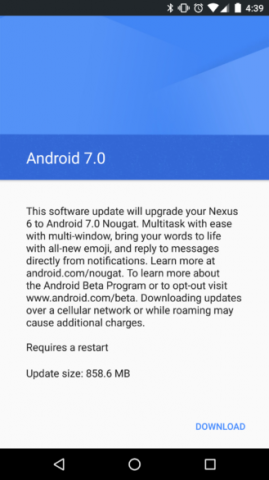 This software update has been tested to help optimize device performance, resolve known issues and apply the latest security patches. Connect your device to a Wi-Fi network, or make sure it has a strong Wireless network connection. Check out the latest details for Google devices and upgrade to a newer smartphone.